during this year's tour de france, erik zabel rode a brand new colnago, the only one in the milram team (or any other colnago sponsored team for that matter) to do so. of course, since every photographer worth his salt managed to spot this quite easily, due to its not being in the white of the rest of the team's colnagos (it was painted in what colnago are now offering as prza). while the mainstream press were unsure as to what they had found, colnago were very kind in supplying thewashingmachinepost with specifications and photos that nobody else seemed to have. but since what turned out to be the colnago eps had been preceded in the revealing stakes by the cx-1, i really wasn't expecting to have an eps to test until well into october/november this year. so it was a surprise to be informed by colnago uk that after being exhibited at the start of the tour of britain, an eps would be heading my way for a couple of weeks' holiday on islay. so now that i know what erik knows, i'm going to tell you. in common with most of colnago's other top range carbon frames, the eps is available as frame and forks only, so despite colnago uk having sent up a complete bicycle, the review is principally concerned with the bits that colnago made, though it's obviously not possible to review a frame entirely in isolation. the eps is a big frame; big in the sense that the tubes are considerably oversized, particularly in comparison to the now somewhat dated looking c40 sitting on the workstand in thewashingmachinepost bike shed. happily, colnago has continued use of the tube and lug system that has been a feature of their finest frames since the aforementioned c40 - ernesto favours this method of construction because the frame is able to hang together before any glue or autoclave enters the equation. the top tube maintains most of its heft at the juncture with the head tube lug, tapering to a smaller diameter where it subsequently joins the seat tube. of all the tubes on the eps, the latter is probably the only one to resemble a normal bicycle tube. of course, this is all relative; the carbon seatpost is the same 31.6mm as utilised in the extreme power, so it's not quite in the drinking straw category. the head tube is impressively enormous, necessarily so because colnago has, along with the monocoque cx-1, fitted a semi-integrated headset. so now the bearings are inside the head tube, and that needs space and girth. the down tube is also huge, as is the juncture with the bottom bracket - just looking at this particular part of the frame makes it all clear as to why they gave one to erik zabel. perhaps the subtly obvious feature of the eps is the fact that the main tubes are all round; colnago has placed all the reinforcing struts on the inside, and the last time i was shown a cutaway of one of colnago's carbon tubes, the finish on the inside truly vied with the exterior. the rear triangle has all the markings of the original b-stay, but has completely ignored the hp chainstays originally seen on the c40hp, now only remaining a feature on the c50 strada. the stays on the eps are the well favoured leaf stays which are visually more refined than the hp version, and arguably more effective. unlike the headset on the cx-1, the eps features 1.125" at the top tapering outwards to 1.25" at the bottom. this ends in a very substantial set of fork legs which, more or less, blend smoothly into the base of the head tube. for a frame that retails little below £3000, it was a bit of a surprise to see those lawyer's lips on the dropouts, turning a quick release into something a lot slower. while they may not yet be a legal requirement in europe, it appears that the opposite is the case in north america - and colnago sells a lot of bikes in the usa. if you are but a recreational cyclist (albeit with a large income), these are a minor irritation; if you intend racing on an eps, you are likely to feel enough heat and anger to file the blighters off. sadly, this will invalidate the warranty on a very nice set of substantial forks. the seat post fitted is a very fine colnago badged and clearcoated model of substantial length. still maintaining the oft criticised twin bolt saddle fixing, they have endeavoured to lessen the frustration encountered with adjusting the original version, by adding a serated thumbwheel for the front bolt. while i still can't see any real advantage in this twin system, this is marginally easier to use than the one on my c40. previous carbon colnagos only accepted a proprietary 28mm post, so you pretty much had to take what colnago supplied, but there is a wider variety of 31.6 posts. 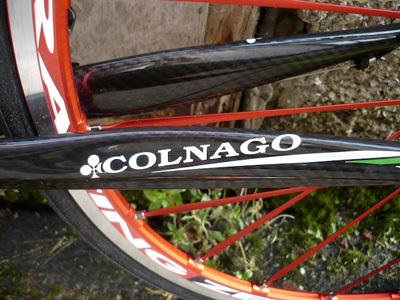 if you don't really mind that it doesn't say colnago on the side, you now have some options. regular readers will be aware of my distaste (to put it mildly) for the integrated headset fad which unfortunately seems to have taken hold of the entire road bike market. colnago's semi-integrated version has the bearing cups press-fitted into the top and bottom of the massive head tube, and features replaceable cartridge bearings. as ernesto says in his washingmachinepost interview, this is what the market demands, so he has, willingly or otherwise, gone along with the trend. 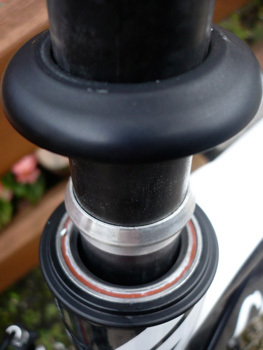 i'm also not sure about the necessity of the tapered steerer, but more of that in the ride section below. the only bit that i don't find really impressive is the current spread of colnago colour schemes (with one or two exceptions). this eps arrived in carbon and white which, while not exactly tawdry in any way, to my mind doesn't compare with the metallic, airbrushed finishes that have been seen on colnagos over the past few years. granted, they too came in for criticism at the time, but the colourway on the test eps (amit) was too plain, too geometrical and quite frankly, a bit uninspired. there are, of course, many others available, and personally, i'd have the same colour scheme as erik has on his eps. the rest of the build is pretty much all italian. living only a few miles away is italy's full speed ahead (fsa) (who are rumoured to have supplied the headset), of which their slk unidirectional monocoque carbon bars are mated to an fsa aluminium stem. the finish on the bars is very similar to that of campagnolo's record carbon chainset which adorns the bottom bracket, and is an integral part of the record groupset fitted: ten speed ergopower levers, rear and front mechs, cassette and brake calipers. the saddle is the rather colloquially named 'nago model by prologo who seem to be responsible for supplying colnago with all their saddles these days, including most of the 2008 sponsored teams. 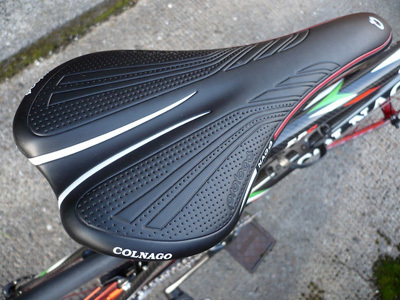 the top is a sort of rubbery, waterproof finish, and labelled colnago on the right rearward side. the wheels were a very classy looking pair of red fulcrum racing zeros. these are quite similar to mavic's ksyriums, and feature radial flat blade aluminium spokes front and non-drive side rear, while the chain-side is built two cross to offset the higher stresses experienced by that side of the rear wheel. the fulcrums rolled on a pair of vittoria revo kxs clinchers which have already been reviewed on the post. the whole package weighed surprisingly little, bearing in mind no special components had been used to make this a superlight machine. on the saturday morning port mor wheelers for islay's kids, it was seen as very impressive that the bike could be lifted to shoulder height with one finger. maybe it's just me, but the impression gleaned from colnago's naming of the extreme power, was of a need for exactly that. i did tell colnago at one point last year that i had no great desperation to road test one of these frames because it would probably leave me with feelings of inadequacy. if it was deemed to be the very ideal set of carbon tubes for the likes of erik zabel, alessandro pettachi and oscar freire, what chance did a skinny old bloke on islay have. so the arrival of the eps kind of caught me by surprise. the bike was almost on its way by the time i found out, but since this was one of the first of colnago's machines with an integrated headset - a major departure - why on earth would i turn this one down? well, depending on who you listen to, eps is either an acronym for extreme power special, or extreme power super. either way, any misgivings i may have had over my abilities with last year's model were multiplied by association. the tubes are huge by comparison with the ageing c40 occupying thewashingmachinepost bike shed, if anything giving even more cause for concern. sunday rides are the ideal entry level start for any bike review; the first 15km can be taken at any pace i like, before meeting up with the great unwashed, who may just decide that hammerings have to be dealt before coffee. as previously mentioned, i'm somewhat of skinny (i prefer 'slim') proportions and had a horrible feeling that the bike was not going to be gentle with me. oh how wrong can one man be? i have no idea how colnago have achieved a bicycle frame with this quality of ride; it is stiff - very stiff - but it's also singularly the most comfortable bicycle i have ever ridden, if that doesn't come across as too much of a contradiction. i love my c40 dearly, but i'd replace it with the eps at the drop of a hat (and a not insubstantial amount of money). and while it doubtless has the qualities to satisfy mr zabel, i have been completely incorrect in labelling this as a one trick pony. and i tend to think i am not alone in this. to put my favourite moan to bed before we get on to the real stuff, the integrated (or semi-integrated, as colnago would have it) headset works just dinky doo. it may even be a major contributor to the overall feature set of the frame, but i still get the notion that it's more a cosmetic feature than mechanical. it certainly makes for a seriously impressive head tube, and looks very smooth as it heads towards the fork crown. but i'm going to hold onto my suspicions. but firstly, find a hill, any hill, short, long, steep, whatever and stand hard on the pedals. the darned thing just wallops up that incline with no shimmying, no lateral movement. no nothing. it goes uphill like you wouldn't believe, totally belying its reputation as a sprinter's workhorse. 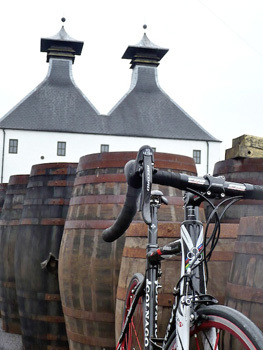 the run down from bowmore to bruichladdich covers a variety of road surfaces though with only a couple of short climbs. but it has some scarily crap road surfaces along the way, surfaces that were covered by the eps as if it was traversing glass. well, not exactly, but from a frame with such colossal tubing and every effort put into its rigidity (the great god stiffness) colnago could have called it the parker-knoll. this was luxury of an order of magnitude greater than that portrayed by the 'bog standard' c50. handling on every colnago i have ever ridden has been little short of exemplary, though you need not take only my word for that. many a reviewer has gleefully pointed out how, on tricky descents, a colnago rides as if it were on rails. the eps does that on steroids. messrs hastings, harmon and smith will happily tell you just how crap i am at heading downhill, but this may just be the frame to cure my deficiency. doubtless i now have to eat my words and admit that the tapered steerer (1.125" to 1.25") may just be a good idea that i have disdained from day one. yet none of the obviously increased stiffness filters through in any other way; there is no loss of comfort through the bars (which themselves were very, very good). you would have to try awfully hard to push this bike too far. 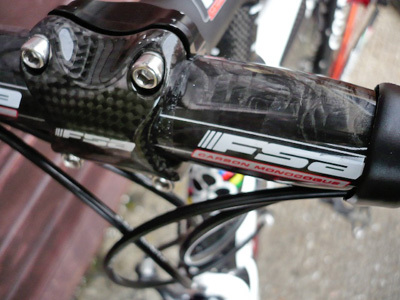 my c40 is fitted with an fsa carbon stem and bars, the latter being the beautifully woven k-force. 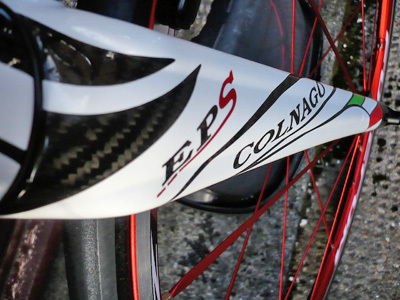 the eps had an os 115 fsa alloy stem mated to a pair of monocoque fsa slk carbon bars. these have the same marble finish as campagnolo sport on their carbon chainsets, a look that, on a purely cosmetic level, is particularly attractive. 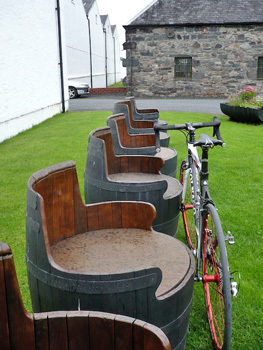 now, i don't really know much about testing handlebars; they either impress, or they don't, but bars are bars are bars. aren't they? well, perhaps not - this pair from fsa had that indefinably excellent quality that put them easily in the same class as the colnago. i am now seriously considering a pair of these for the company c40, and i'd certainly insist on a pair if i had the wherewithal to own an eps. over a period of time, i have discovered my posterior to be somewhat saddle agnostic; there are favoured perches, such as pretty much anything from brooks, and there is the occasional model that only imparts pain and discomfort (a san marco aspide to be quite precise). the prologo 'nago fitted fits into the former category - in fact, i rather liked it, though the rubberised surface did provide some interesting noises if i needed to slide back on the seat. generally speaking, this is a fine saddle to complement any colnago frame, particularly if it matters to you that the name on the frame is the name on the seat. but i like going uphill, and if i'd been in the market for a new colnago do do just that, i'd have immediately by-passed the eps and gone straight to an extreme c. oh gosh, how wrong i would have been. this is not to say that the extreme c does not do exactly as it says on the tubes, but the eps hides its climbing light under a very substantial bushel. there's smiling, and then there's smiling. not that it had a great deal to do with climbing, but i spent a whole hour out in the pouring rain, testing one of portland's top waterproofs, and i had an ear to ear smile the whole time i was out. it really is that good. of course, not every prospective eps owner is going to want to employ their new carbon steed to get to the finish line quicker than anyone else. i don't race at all, and judging by a lot of the correspondence that comes my way, there are a lot of other colnago owners (and prospective colnago owners) who simply enjoy ownership of such a fine italian bicycle to allow a fast sunday ride. while the fulcrum zeros are an excellent pair of hoops if you want to race, it seemed perfectly in order to try the eps with a pair of quality hand-builts to see how well everything would proceed in the comfort stakes. so off came the zeros and on went my pair of chris king customs, still running on the favoured schwalbe ultremos. since everything about this bike has been a surprise, it really should not have come as a surprise that the result too, was a surprise. as mentioned somewhere above, the eps has proved exceptionally comfortable despite incredible stiffness where needed. fitting a pair of proper wheels put the eps in the same category as rapha's new scarf - pure silk. i've covered a sizeable number of kilometres with the pink hubs and the ride is quite incredible; while i usually spin up hills quite quickly because i enjoy it, it only needed a brief incline to present itself, and i was off again, just so that i could enjoy the feeling returned by blasting uphill on such an amazing machine. i could, in this case, have done a marcel wust and moaned incessantly about how a brand new colnago that's barely reached the shops yet, arrived with last year's camapgnolo record ten speed. surely a bike like this demands eleven speeds? well, since this particular bike will be returning with the tenth sprocket as clean and shiny as it was on arrival, what the heck would i have done with eleven? yes, it would have been nice to try, but the object of the test was the colnago eps, not what it was fitted with. 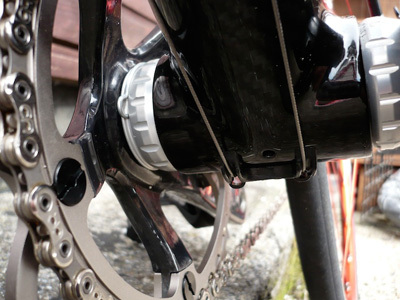 since many may complete their eps with shimano or sram, the componentry really ought to be transparent in use. of course, the downside to testing any frames, not just colnagos, is that they have to go home now that i've finished, i really don't want to send this one back. if you're one of the fortunate with the necessary three thousand pounds (or just under), burning a hole in one of your three back pockets, and a new frame is in the frame, i would seriously recommend you consider the colnago eps. 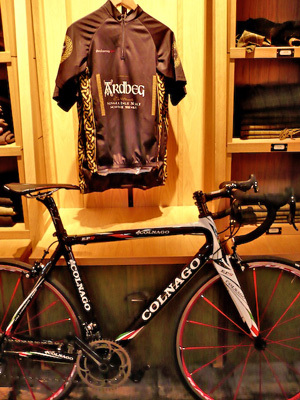 many thanks to peter and rob at colnago uk, and to ardbeg for lending me their distillery for a morning.